When is the new devblog coming? @Olof? @Fredrik? Oh yeah. How didn’t I remember that? Please dear executives, again lets try to keep the discussion here relating only to Alpha 30! Alpha 30.1-5 going up now. A lot of great reports coming in from this weekend’s deployment. This will be the first of this week’s either two or three deployments, more info on why in the dev blog out now. This is rolled out on the experimental branch, we will most likely transition to default before the weekend with Alpha 30.1-6 or -7. Alpha 31 Small but gets a lot of people playing from other countries! Alpha 34 - aircraft maintenance? Hi, great soundtrack, love it. Just a question, have you considered releasing the soundtrack outside of the game? I’m a huge fan of soundtracks from movies and games and would so like to walk down the streets where I live with this soundtrack in my ears. I am certain other feel the same way too. I know of other games that has released their soundtrack as a downloadable content through steam. Welcome to the Airport CEO Forum! I also really hope that the soundtrack will be released on like Spotify or iTunes or something. Right now we’re looking into bundling it as a DLC on Steam and possibly to provide it via Bandcamp. It will, in the future, of course be made available via Spotify too. Yeah, exactly, we realize it’s a “small” update since the only thing you’re getting is a different language but the development effort to make that possible is quite large. But it’s handled separately by @Alexander so we do expect these three Alpha 3X updates coming within quite close proximity of each other and you can never have too many or frequent updates, right? I have an issue where my ramp agents aren’t doing their jobs. 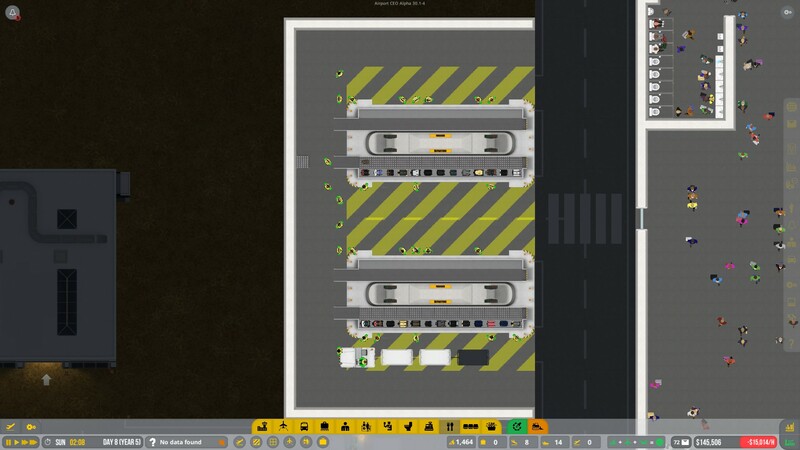 So my baggage bays require six ramp agents per side, but there are more than 24 in that room. As far as I know, some of them have claimed jobs like baggage loading, but they are not moving. And I’ve tried to refresh the game many times. This will be fixed in a few minutes! *It also helped to close and re-open the baggage bays. I´m having problems with the ramp agents for the remote stands. First, in many cases, the service car is picking up +10 ramp agents for ONE stand, and often is maybe only eight taken back to the terminal, and the two there is left back at the stand stocked. Am I the only one having this problem? I’m having them take 8 and return with a number that I don’t know. Question: Is it normal for ramp agents to take longer to unload/load bags at stands compared to unload/load bags at baggage bays?